Movies being shown today are surgically produced for specific audiences. Whether its millennials, baby-boomers, or seniors, producers have resorted to targeting audiences by their age demographic as a way of capturing more box office dollars. Millennials, apparently are drawn to stories set in the dystopian future, and loaded with visual pyrotechnics of super-human heroes, aliens, and end-of-world scenarios (matching the images they see 24/7 on their IPhones and home videos). Perhaps, escapism is their way of expressing their displeasure with their lives in the 21st century. The Baby-Boomers have territorial and film interests that live in two age demographics. Heavily influenced by the 60’s and 70’s that include the unpopular Viet Name war and its aftermath, and the guilt over the success of consumerism at the expense of the American dream and its growing social and economic disparity, are just two issues that shaped the boomers’ stories, novels, and screenplays. In the senior category age demographic, there is a bygone element when it comes to describing the interests of seniors The popularity of “Turner Classic Movies” on television underscores their penchant for looking backward to a time when the world was less chaotic A time when life moved at a pace that allowed society to adjust and better prepare for the inevitable Alpha and Omega ‘bell jar curve’ for the journey we all call life. The epic British film “Dunkirk”, written and directed by Christopher Nolan, boldly incorporates its powerful text, photography, sound effects, and editing in its effort to cross age demographic lines to tell a human story of heroism that helped change the face of Europe and the world during those early and very dark days of World War II. “Dunkirk”, opened nationwide on July 21, 2017. Obviously, it’s too early to say how box office receipts will reflect the movie-going public’s interest concerning the plight of some 400,000 British, French, and allied soldiers trapped, and facing annihilation by German troops on a slender stretch of a French beach in the city of Dunkirk during 1940. Only time, will tell us that. America was not officially involved in “Europe’s War” with Hitler. Not until December 7, 1941 following the sneak attack on Pearl Harbor, Hawaii, by the Empire of Japan, did America declare war on Germany and the Axis powers. I apologize for the didactic mini history lesson, but faced with the fact that very few American public schools no longer teach history, civics, geography, or even cursive writing, I feel a factual, historical backstory might prove helpful in putting the film in its proper perspective and provide better understanding of the events that took place 77 years ago. Relatively speaking, there are no ‘star turns’ from “Dunkirk’s” actors that propel the movie forward. Nolan has decided that a non-linear ensemble approach works best for his film. 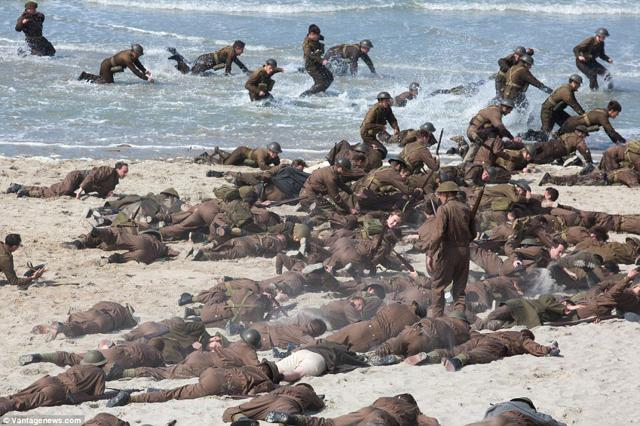 There are no “The Longest Day” sequences with stars recreating the effects that combat does to human beings. In Spielberg’s “Saving Private Ryan”, the audience was given glimpses, both physically and emotionally, of war’s capriciousness when it comes to who lives and who dies. One of the most powerful and devastating scenes in that movie, for me, was the scene where an American military vehicle is seen approaching a rural mid-west home as seen from the inside looking out the front door. As the American officer gets out with an envelope in hand and approaches the front porch, a middle age woman watching him approach slowly begins to slump, to melt, as it were. As each footstep gets closer and closer to the front door, she quietly begins to sob, while crawling toward the front door. The scene has no dialogue. It is one of the ‘purest’ cinematic moments in film history. No dialogue was necessary to convey the obvious message that war is the scourge of civilization. 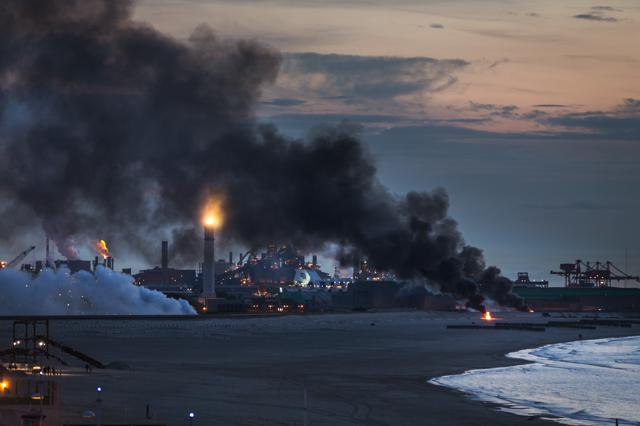 Director Nolan films the events of the evacuation operation from Dunkirk back to England and temporary safety, by dividing those events into three segments. The ‘the land’ or beach sequences, the at sea sequences, and the aerial combat sequences. All three components were filmed in the actual locations, wherever possible. Everyone seen by the camera is fully engaged and in their on-screen moments reminding me of the verisimilitude of the great French film classic “The Battle for Algiers”, that was shot documentary style; blurring the lines for the audience between scripted scenes and actual combat footage. It was all scripted. “Dunkirk”, also is a taut, riveting, and immersive film experience, thanks to the herculean effort on the part of Nolan’s immensely talented technical team. Led by cinematographer Hoyte Van Hoytema, the cameras capture the smallest of details in the tiniest of spaces, as well as the sweeping shots of the action and mayhem taking place in all sequences. These scenes are not only intense but ‘Hitchcockian’ in their use of the suspense aspect; especially while filming both above and below the water. The combat aerial photography also is spot-on and nail-biting. “Dunkirk”, like “The Battle for Algiers”, was totally scripted. Nolan has assembled a wonderful ensemble cast of principal actors to tell the “Dunkirk” story led by Kenneth Branagh, as Naval Commander Bolton, who must make the critical decisions involved in the evacuation. The cast also includes: Academy Award winner Mark Rylance, as civilian flotilla boat owner Mr. Dawson, Tom Hardy and Jack Lowden as RAF pilots, James D’Arcy as Colonel Winnant, Harry Styles as soldier Alex, Fionn Whitehead as soldier Tommy, Aneurin Barnard as Gibson, and Cillian Murphy as a battle-fatigued soldier. Director Christopher Nolan, production designer Nathan Crowley, film editor Lee Smith, and an army of sound editors and technicians should all be on the 90th Oscar’s nominations list come March 4, 2018. These people created the designs for all the grittiness, grime, and realism seen and heard on the screen. A clever directorial touch by Nolan is the continuous sound track of either airplane engines, music or sound effects of bullets or bombs thudding into bodies on the ground or piercing the fuselages of the airplanes. That creative input originally came from “Thirty Seconds over Tokyo” with the continuous sound of airplane engines droning throughout all the air sequences to heighten the tension and keep the viewers focused on the visuals and the bombing mission at hand. If I had any misgivings or disappointment with the production, it would come in the form of the music and sound effects, great as they are, being played too loud; drowning out some of the dialogue. Dialogue is usually the best way to communicate and thanks to NPR, the BBC, and Masterpiece Theatre, we Yanks are getting better at understanding those unfamiliar and challenging, accents of Northern England, London, the southern coast and the west-country. The thrust and premise of Nolan’s movie, none the less, is magnificently produced and stirringly summed up at the conclusion by English Prime Minister Winston Churchill’s famous and inspiring words of his “we will never surrender” speech to his countrymen and the free world, which still resonate today. “Dunkirk” is now in general release in a theatre or a multiplex near you. Reposted by Jack Lyons and Desert Local Nerws.